In 2002, A Better Chance of Westport was just a dream. In the 15 years since, the ABC program has fulfilled dreams. 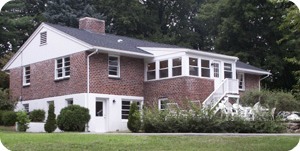 Young men have come from across America to Glendarcy House, on the corner of North Avenue and Cross Highway. They’ve attended Staples High School, and gotten deeply involved in school and community activities. They’ve gone on to college, and embarked on careers. They’re already getting married. They’re success stories, and Westport should be enormously proud of them. The longtime resident of Westport has led quite a life. He captained the University of Pittsburgh soccer team; been a high-level executive at RCA, TWA and Oxford Health; chaired the local United Way board; worked on senior housing with Westport’s Human Services Department, and served on TEAM Westport. Now 77, he’s involved with his wife Cheryl Scott-Daniels’ real estate firm, CSD Select Homes. But it’s his stints as president of A Better Chance of Westport that give him special insight into what this town means — to its residents, and those who come here from very different parts of the country. Still, as an African American — even dressed in a suit and tie — he has been followed around in local stores. And he’s waited to be waited on, while employees ask white shoppers if they need any help. The 2016-17 A Better Chance of Westport scholars. In their new high school, they learn study skills. They choose from a broad range of subjects. They discover an array of college options. They work hard, join clubs and teams. Outside of school, they become involved in community activities. It’s excellent preparation for “being around people who don’t look like you,” Daniels says — which is what happens after they graduate, head to college, get a job. In its first few years, ABC directors and many volunteers throughout Westport had to take it on faith that it was worth it. Now they know. Since A Better Chance of Westport began, 18 scholars have earned college degrees. Eight more are still in college. Three are in grad school: law, medicine and business. Staples students (and their younger siblings) get to know the ABC scholars. As friends, teammates and through host families, they hear the young men’s stories. They learn about differences — and the similarities they share. As president, Daniels says, his biggest challenge was “getting young men to understand their potential.” They’d never been exposed to things like how to study; importance of networking; what a “good” college is, or how to do well on SATs. ABC’s Glendarcy House on North Avenue. Scholars spend some weekends with host families. In its 15 years, A Better Chance of Westport has accomplished much. It’s given — literally — a better chance to more than two dozen fine young men. They in turn have positively impacted their high school, and the entire town. Now they themselves are giving back. They’ve formed their own alumni network. They return to Glendarcy House, and are available by phone and email to help the scholars who have followed them to Westport. “That building block is very solid,” Daniels says. But what’s a success story without a celebration? Every March, ABC holds a “Dream Event.” This year — on March 25 — the gala honors the organization’s past presidents. Besides Daniels, they’re Lee Bollert, Gail Cohen, Dave Driscoll, Harold Kamins and Eric Seidman. 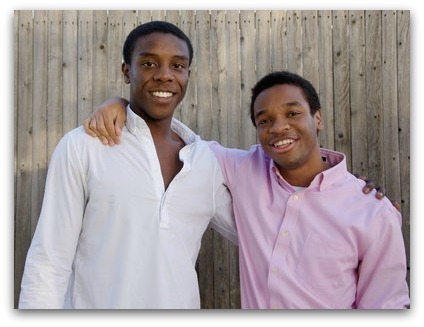 Sam Larkin and Manny Ogutu, this year’s graduating seniors. There’s dinner, an auction and entertainment. But the real draw is the ABC scholars themselves. There are heartfelt speeches from the graduating seniors (this year: Sam Larkin and Manny Ogutu). A couple of alumni add their own — now adult — perspectives. Hearing them speak, I always tear up. And I always leave feeling good — about these young men, my town, this program, and the importance of the work that so many people like Steve Daniels have done, for 15 great years. This entry was posted in Education, Organizations, People, Staples HS, Teenagers and tagged A Better Chance of Westport, Glendarcy House, Steve Daniels. Bookmark the permalink. Anyone who has doubts about white privilege in Westport should take note of the above. A wonderful portrayal of a wonderful man – and the organization he’s done so much to further. And – as Dan points out – “the benefits flow both ways.” Clearly, ABC has acted as a fountain of youth for Steve, who looks nowhere near the age cited in the article! Perhaps the best way to share in these magical benefits – and to really get to know an ABC scholar – is to serve as a host parent. 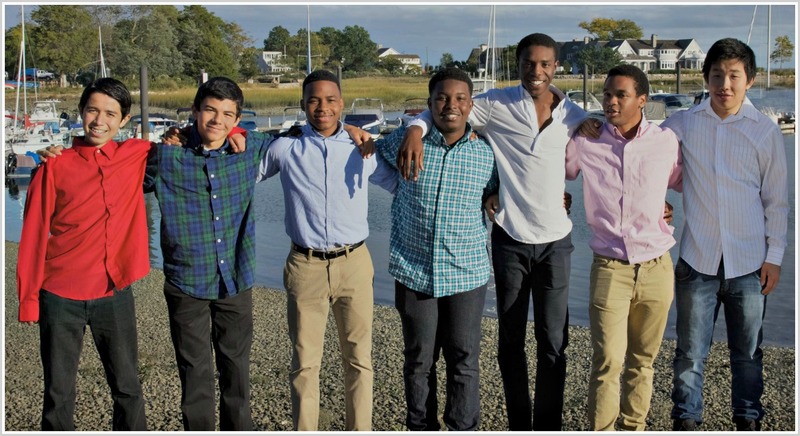 You’ll share your home with one of these remarkable young men on Sundays (and one full weekend each month) throughout the school year. And you’ll end up with a lifelong relationship that you’ll treasure. Interested? Email me and Michael Wolfe, my ABC host family co-chair, at abchostfamilies@gmail.com. Great shout out to Steve and the work he does for our community. I first met Steve when I coached his son as a member of the Staples Hockey team longer ago than either of us would want to admit. While he and I viewed the Barons South Senior Housing Project differently (he was for and I wasn’t) he was a great listener and always kept the discussion civil and on point. Steve and Cheryl, the Town of Westport owes you a standing ovation. Thank you! Savion is a Westport hero. What a wonderful young man. You should be very, very proud! Savion is indeed a treasure – as is the Mathias family, who have served as a host family for two ABC scholars.